What the Heck is a "Soupy" Pizza, and Why is it so Good?! Hello again and Happy New Year NEPA Nation! I apologize for my lack of new pizza reviews over the last few weeks as the first lady of NEPA Pizza and I have bought our first home, and we have been performing important tasks like moving my dough mixer, baking stone, cleaning the new pizza oven, and making a mess of the kitchen - not to mention painting, painting, and more painting! Not to fear, we are back and ready to review just for you! Newtown Cafe has been highly recommended to me by many in the NEPA Nation over the years, but because of distance and scheduling I had a tough time getting there. Finally, I received an email from a reader, Sam, who recommended strongly that I get to Ashley, PA and try the place out. The thing that really peaked my interest was that Sam described the pizza as "Thin and Soupy." I thought to myself, can a good pizza really be described as "Soupy?" Judging by Sam's insight and the places he listed as his favorites, I trusted him as having a quality judge of pizza character and decided to head south and try it out! I teamed up with a buddy of mine for this review and we found the place without issue. After parking around the rear, we weren't quite sure where the entrance to the place was, but we took a guess and found that the side door at the top of the steps was the right one! 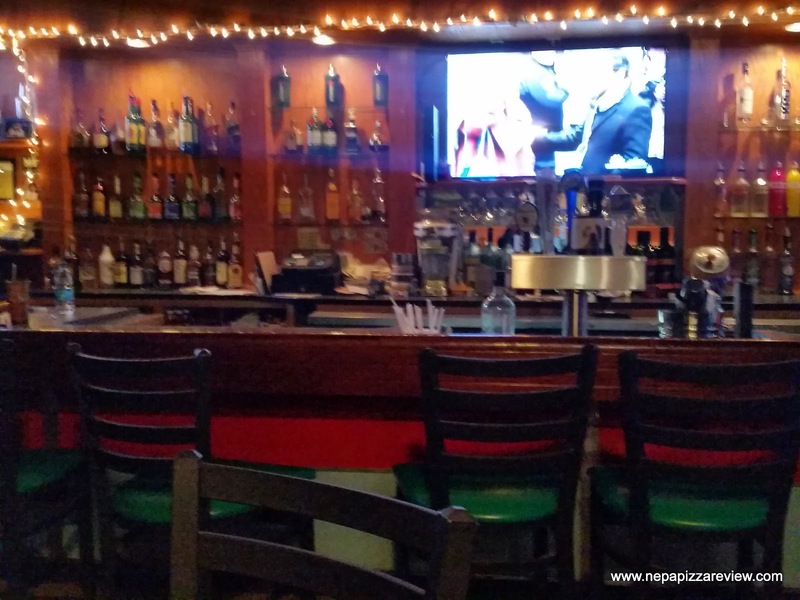 Upon walking in, I felt right at home in the comfortable and relaxed dining and bar atmosphere. The place had a separate dining room and bar, both of which were on the small/medium side, but certainly not cramped. We choose to sit at a high top table in the bar area so we could watch some TV while we waited for our pizza. When the friendly waitress came over, we asked what the difference was between a bar pizza and a regular pizza was, and she told us that a bar pizza is four slices, and a regular pizza is eight slices so we went with the regular, and an order of wings as an appetizer. The wings were ready in no time, and they were large in size. The sauce was more sweet than hot, but enjoyable nonetheless. Shortly thereafter, the pizza was piping hot and ready. 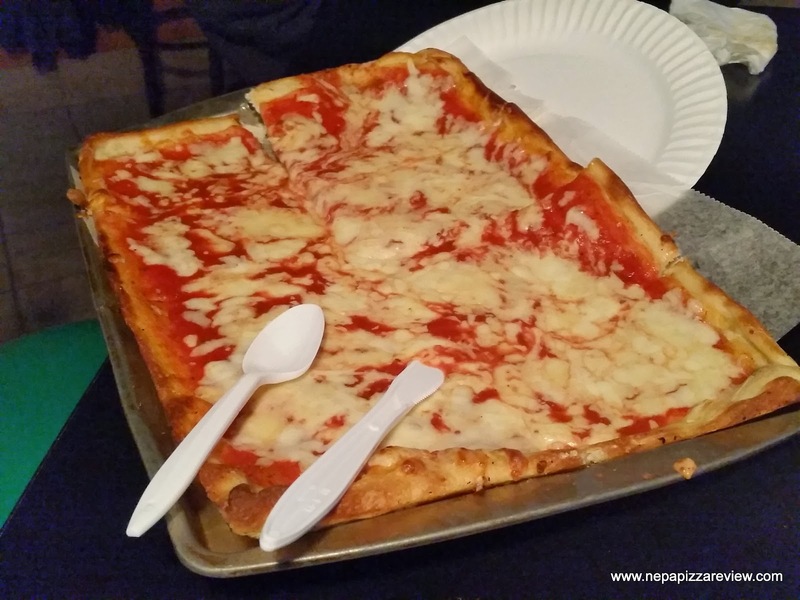 The thing that jumped out to me was that the "Soupy" pizza was served with a spoon - how perfect! Clearly there was a lot of sauce on the pie and that made it appear it might be a challenge to eat, but thanks to the spoon we would not have any problems here. 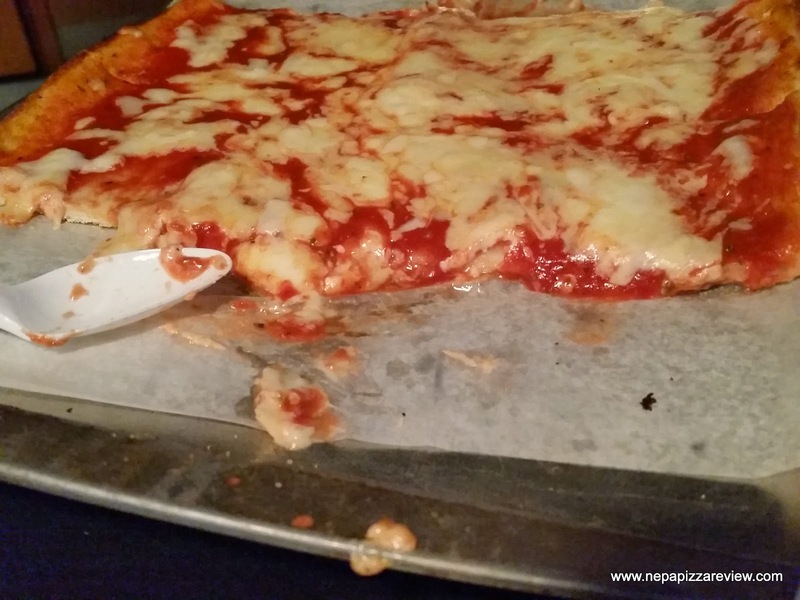 I have to say that eating pizza with a spoon is a first for this pizza critic! We slid our first slices on the plate and found that the pizza was not as difficult to eat as it looked, although the spoon was very helpful in scooping the escaping cheese and sauce back onto the crust. I expected the crust to be soggy because of how thin it was and how much sauce was on top, but this was not the case at all. The crust was actually quite crispy and very flavorful with almost a slight buttery flavor with a nice crunch and wonderful aftertaste. The sauce was very good, with a nice body, a certain sweetness, and finishes with a satisfying garlic flavor. The cheese (presumably american) was gooey, melty, and delicious. Both my buddy and I enjoyed the pizza a great deal, and we both agreed that we could easily have eaten the entire tray ourselves. The waittress recommended the B&B which is extra cheese and burned on top which I think would be very attractive to many of my readers, but I'm not a burned american cheese type of guy. I was lucky enough to be able to meet the owner after our meal who told me that she sticks to her roots by using the original recipe and pizza ovens. There was a very friendly customer who overheard our discussion and attested that all of this was true and that the pizza here is the best around! Overall, I'm so thrilled that we made the journey to Newtown Cafe because it is so unique and delicious. Next time I go, I'll be feasting on an entire pizza by myself and chilling out for a longer period of time since we felt so welcome there and enjoyed our meal. I highly recommend this pizza to the NEPA Nation and I hope that you will share your thoughts and comments below!